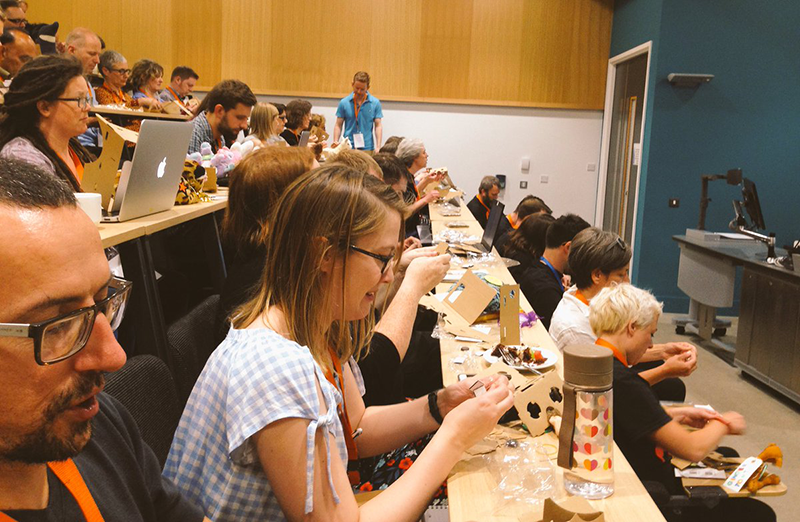 Katie Piatt and Nick Feather from University of Brighton’s eLearning Team recently ran a workshop session at the 2017 Playful Learning Conference titled “Choose Their Own Adventure – Travels in Virtual Reality”. This idea came about because we were keen to explore some of the 360 technologies being used in teaching at the university and a Playful Learning environment seemed like a great opportunity to fully immerse delegates in some new learning and teaching ideas. Playful Learning in Higher Education can take many approaches. One method the eLearning Team has supported in the application of teaching can be described as a ‘choose your own adventure’ template using classroom engagement apps. To illustrate with an example, a Blended Learning tool such as Nearpod offers the ability to deliver content to students in a dynamic, non-linear fashion, so you could select a slide depending on their responses. Of course, you could take this approach with a simple PowerPoint presentation, but an interactive tool such as Nearpod has the option to quickly poll the room and respond to this captured data. So, for example, a session about work placements could be tailored to the particular students skills and interests surveyed in the room. Nick and Katie adapted this technique for the Playful Learning conference to include a storytelling element. Reminiscent of the ‘choose your own adventure’ style childrens’ books, their workshop gave attendees the chance to either vote or contribute to the main story elements: characters; location; mode of transportation; obstacles and motive. A character had to end up in a distinct location using a particular mode of transport, meet another character along the way (with their own motivation) and face a challenge. The 360 element was supported by the VR content available within Nearpod. Within the workshop session, each part of the story was voted upon using the Nearpod app and suggestions for obstacles and secondary characters were made using the drawing and interactive functions in the app. 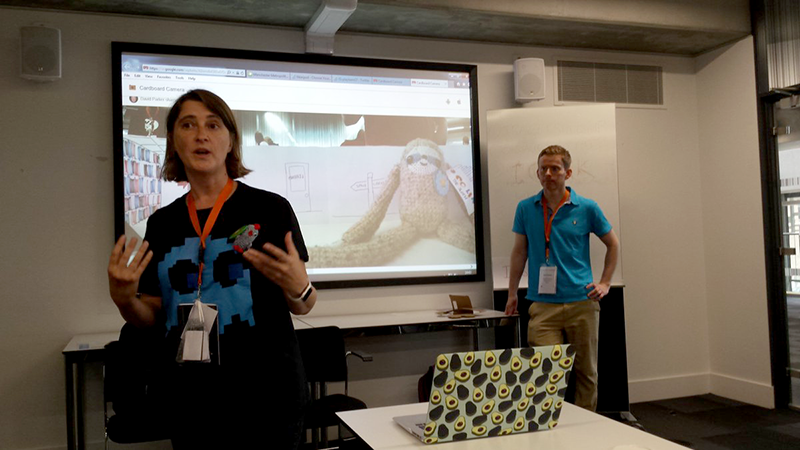 The main protagonist character was to be one of the soft toys everybody was required to bring to conference as part of a separate challenge. With the story set (see if you can figure it out from the examples linked to below) and working in groups the delegates were asked to build the story’s climax as a table-top model, using card, pens, paper and anything else to hand. They created their 360-degree panoramic backdrops by connecting together and illustrating 8 sheets of A4 paper. Once the scene was set, the groups used a smartphone with the Google Cardboard Camera app installed to take a 360 recording of their model, placing the phone in the centre of the scene (a small piece of Blu Tack help to steady the phones) and slowly rotated until the 360 panorama was captured. You can see some of the group efforts by following the links below. If viewing in web browser you can scroll left-right to explore the scenes. If you have the Google Cardboard Camera app installed and a pair of Google Cardboard specs you can immerse yourself fully and listen to the captured audio. If you would like more information about the workshop challenge and fancy having a go yourself, there is a web page with instructions. You will need a Google Cardboard viewfinder (which start at about £1 each from online shops) and a the Google Cardboard Camera app downloaded to your phone.